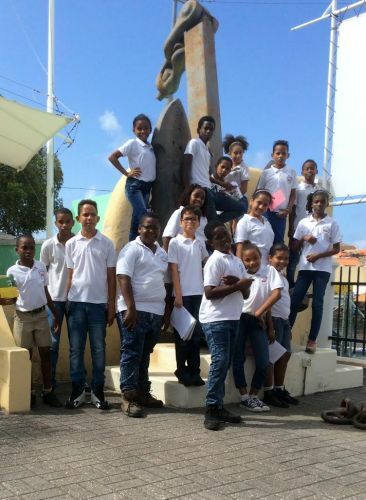 Each school year the Maritime Museum organizes an educational tour for students in Group 6 of the Basic Education. During the excursion the children get a harbor tour with the famous blue ferry and afterwards a tour in the museum itself. The museum has been organizing these trips since the school year 2000/2001 and with approximately 1,750 students per year, a total of more than 25,000 students have experienced the tour. Last year the museum has received students from 42 primary schools which in preparation studied the book "Our ports, then and now". By reading the book, which is made by Fundashon Material pa Skol, the students learn what can be seen during the harbor and museum tour. If you would like to sponsor a local school for this project for only NAf. 350 for one class and NAf. 1000 for three classes, or any other amount, please call us or send an e-mail to info@curacaomaritime.com. Obviously, these annual trips are not possible without the help of sponsors. Fortunately for years now we have a group of permanent sponsors making this possible. These are the Banco di Caribe and Curaçao Ports Authority, but also AB Courant, Advocatenkantoor BBV Legal, AON Antillen, Curaçaose Wegenbouw Maatschappij, CMTC, Curoil, DVB Bank America, Licorus Maduro, Manrique Capriles, Martijn Trading (Curaçao), PwC Dutch Caribbean, Refineria Isla Curaçao, Samsom Bookstores, Securitas Antias / Impacto, Spigt Dutch Caribbean, Studio Acht Caribbean Architects, STVB Advocaten (Curaçao), Trustmoore Curaçao, VanEpsKunnemanVanDoorne, Vidanova and two anonymous sponsors. They are key to to the realization of this educational school project and each year again make it possible for many students to enjoy the educational field trip.